In recent years, the days between Thanksgiving and New Year’s Day have almost become one long ‘holiday vacation’. With the exception of the retail sector, folks seem to slow down, work shorter days, and even sneak away during the middle of the week to take advantage of excellent cool-weather trout fishing. Cool weather and waters mean that spotted seatrout, certainly the most popular fish species found along Florida’s Big Bend, begin to seek protection from the cold in deeper waters, especially in easy-to-reach river and harbor channels. On weekends you’ll find these spots crowded, but on weekdays, you’ll likely have some of the best trout holes all to yourself. The two coastal rivers that usually come up in any conversation about trout fishing among north central Florida anglers are the Suwannee and the Steinhatchee. Two more different rivers in structure don’t exist, but in each of these the cool-weather trout fishing is excellent. The massive and deep Suwannee flows to the Gulf from its far-away source in Georgia’s Okefenokee Swamp. The Steinhatchee is short and generally shallow, but has some excellent deep holes scattered along its rocky bottom, especially near the coastal shoreline where it empties into the Gulf. At Suwannee, one of the most productive winter trout ‘holes’ is a short trip by boat from either Miller’s Marina or Suwannee Marina, both full-service facilities. The quarter-mile stretch from the mouth of the entrance canal to Miller’s to the ‘Salt River Cutoff’ can often be crowded with anglers in small boats, usually on an incoming tide. It seems the inbound tidal bore holds back the flow of the main river along this north shore, giving lazy cold-stunned trout a good place to avoid the big river’s natural force. Techniques for catching these fish vary, but far and above the most success is had by anglers drifting and casting sinking plugs towards their drift. It’s important that the lure not move too fast, and that it hovers just above the bottom, which can at places can be snaggy due to sunken debris. Just a few twitches of your rod tip are usually enough to encourage these trout to attack, sometimes so softly you’ll not even feel the bite. 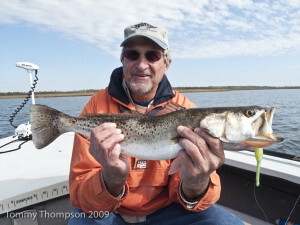 The longtime lures of choice for Suwannee trout are MirrOlure’s 52MR or TTR, usually in a red and white color scheme. With their slow sink rate and lifelike design, these plugs probably account for a high percentage of trout caught in the river here. And they’re also versatile in that they can be slow-trolled, another good trout-catching technique, on days when this stretch of river isn’t crowded. The deep-water trout hideouts near the mouth of the Steinhatchee River are not nearly so smooth and water-sculpted as those at Suwannee. In this river, only 25 miles north of the Suwannee, millennia of slow flowing water have merely uncovered miles of craggy and rugged rocks along the bottom. It’s in some of the deeper of the rocky holes here that you can almost always find seatrout, hiding from the winter’s cold, usually on the lower ranges of the tide. Two areas come to mind, and are immediately apparent to visiting anglers sighting dozens of anchored boats, are the deep hole just downstream from the Sea Hag Marina and the stretch of channel near Marker #26 near the mouth of the river. Like Suwannee, hard MirrOlure MRs and TTs have been popular choices for enticing sluggish trout to bite, but with their array of 3 treble hooks, they are likely to hang up on the hidden rocks. MirrOlure’s recent introduction of the soft, slow-sinking Paul Brown Lures has helped reduce the number of lost lures carpeting the bottom here, as the standard Corky Mullet has but two hooks and the Corky Devil, my favorite, has only one. Retrieve either type of lure as slowly as you can and keep it just above the bottom for the best results. As for lure color, stick with the red and white versions of the hard baits, but try the Pearl/Chartreuse (01) and Dayglow (95) versions of the Corky. One interesting aspect of wintertime trout fishing at Steinhatchee is that a number of sunny days will make a big difference regarding the location of the fish. While the deep Suwannee River stays frigid almost winter-long, holding the fish deep all season, sunny days at Steinhatchee will warm the banks of the river outside the channel. So if the sun’s shining, and it’s been a pretty week, expect to find seatrout warming themselves almost to the grassy shorelines. While Suwannee and Steinhatchee rivers are good examples of natural wintertime trout spots, don’t overlook man-made stretches of deep, protected waters. A good example is the ‘chute’ at Horseshoe Beach. This dredged half-mile trench, between the spoil banks, is an excellent and convenient place to catch a limit of trout on cold winter days, according to Capt. Karen Chadwick. Use the same tried-and-true lures you’d use at Suwannee and Steinhatchee, but be sure to get there at the bottom of a big winter low tide. The downside of wintertime trout fishing is that the trout tend to bunch up and are soon followed by droves of anglers, especially on weekends and holidays. Taking that as a clue, plan your trips accordingly–just don’t jeopardize whatever relationship you have with your boss or family!